Brought to you from the kitchens of Italy, this plate full of iron is also rich in folic acid and vitamin A and makes for a super healthy meal for fussy kids. 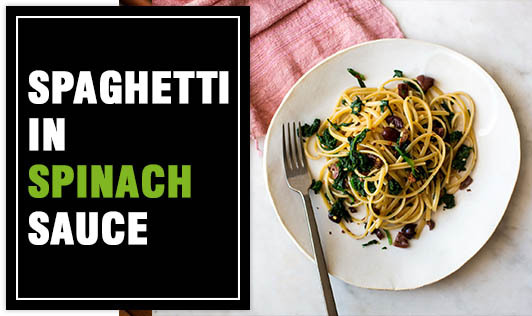 Use whole wheat spaghetti to add more fiber to this recipe. Blanch the spinach in boiling water for a minute, drain, and pep up with cold water. Blend it to make a smooth puree and set aside. Heat butter in a nonstick pan, add chopped garlic and spring onions and sauté on a medium flame for a few minutes. Add the red capsicum, stir well and sauté on a medium flame for a minute or two. Add the spinach puree, stir well, and cook on a medium flame for two minutes while stirring occasionally. Add the cheese, milk, and salt and cook on a medium flame for a minute while stirring occasionally. Add the spaghetti, oregano, and chili flakes. Toss well and cook for 2 to 3 minutes. Note: If you plan to serve the pasta later then, keep the spaghetti and the sauce separate. Reheat the sauce with a little milk or water and then add the spaghetti and serve hot.